The selection won the event. The selection finished in a placing position. The number of placing positions changes across sport and contest. Only applicable to each way bets. The event finished with the selection and a competitor tied for a winning or placing position. The number of selections in a dead heat. The position the selections are tied for. This option is only available for each way bets. For a to-win bet, the dead heat position is always 1. The number of places offered by the bookmaker for this event. This option is only available for each way bets. For a to-win bet, there is only ever 1 winning position. To win bet: the selection didn't win the race. To place bet: the selection didn't win the race or finish in a placing position. The selection didn't participate in the event. This can happen where the event is cancelled or the selection is pulled out before the beginning of the event. The stake is returned in the case of a voided selection. The selection didn't participate. See Void. The outcomes on which a bet can be placed. A bet that the selection will win the event. Returns the full amount when the selection wins, or a partial amount when the selection is in dead heat for first. A bet that the selection will finish in a placing position - the number of placing positions varies across sport and contest. Returns the full amount when the selection finishes in a placing position, or a partial win amount when the selection is in dead heat for a placing position. Place odds are typically stated as a fraction of the to-win bet, 1/2 would mean the odds to place are half those of the to-win option, halving the potential profit. Two individual bets of equal amount, one placed on the selection to win and the other on the same selection to place. Multiples are settled on a win-to-win place-to-place basis unless stated on your betting slip. Used in each-way multiple bets. Returns from the win side of the bet are rolled over to the win side of the next selection. Returns from the place side of the bet are rolled over to the place side of the next select. A less commonly used option for the each-way multiple bet. Returns from the win and place parts of the selection are spread evenly (hence equally divided) across the win and place parts of the next selection. 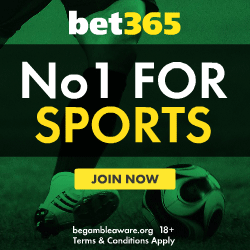 An option for the each-way any-to-come bet that gives priority to the win part of the next selection when there is insufficient funds to cover both win and place parts. For example, should £4 be required to cover a £2 to-win and respective £2 to-place selection but only £3 is rolled over from previous selections, the £2 to-win would be covered but only £1 would remain to-place. Selection prices are stated to-win. Adjustments are often made to this figure to calculate returns. Also referred to as Tattersalls Rule 4(c), this rule exists to protect bookmakers in the case of withdrawals before the race starts. The bookmaker prices a race according to the horses taking part, so should a horse be withdrawn the prices will no longer be fair. Rule 4 allows a bookmaker to deduct a percentage of the winnings relative to the odds of the non-runner i.e. you can expect a greater deduction the more favoured a horse is. See below for the full deductions table. In the case of two or more non-runners the total deduction shall not exceed 90% of winnings. Rule 4 does not apply to ante-post betting, non-runners are treated as losing bets. The proportion of the to-win odds given for a place bet e.g. a 10/1 selection with place odds of 1/2 would payout at 5/1. Dutching is a method of spreading your stake across several selections so that the amount won is the same no matter which selection wins. In some scenarios it may be possible to guarantee a profit by backing every selection in an event. These situations arise when there are significant movements in quoted odds or when differences exist in the odds available at bookmakers and exchanges. Be careful to factor in the commission charged by exchanges on bet winnings. The dutching calculator simplifies the process of working out how much to stake. Bookmakers apply bonuses of varying type and size to lucky 15/31/63 bets. To accurately calculate returns, bonuses must be accounted for by entering the values in the "Bookmaker Bonuses" section of the lucky 15, 31 and 63 bet calculators. Applied when every selection is a winner. Applied when only one of the selections fails to win. Applied when only one selection wins. Usually a 2x, 3x or 4x odds multiplier. There are 3 methods of stating odds that most bookmakers and websites support. Used primarily in the UK and Ireland, fractions quote the potential profit should the bet succeed, relative to the stake. For example, if £5 is bet at odds of 2/1, the potential profit is £10 (£5 * 2) and the total returned is £15 (£10 plus the £5 stake). Decimals quote the potential return should the bet succeed, relative to the stake. For example, if £5 is bet at odds of 3 the total returned is £15 (£5 * 3) and the potential profit is £10 (£5 * 3 minus the £5 stake). Positive figures: The odds state the winnings on a £100 bet e.g. american odds of 110 would win £110 on a £100 bet. Negative figures: The odds state how much must be bet to win £100 profit e.g. american odds of -90 would win £100 on a £90 bet. Odds correlate to probability e.g a 3/1 bet is expected to win one in every 4 attempts, hence the probability is 25%. A stand alone bet on an event outcome. A series of selections in which the returns are rolled over into the next bet. A rollover bet of two selections. A rollover bet of three selections. A rollover bet of four or more selections, popular with football and horse racing fans. To better understand how returns change given different permutations, use the accumulator bet calculator. An accumulator of 4 bets is also referred to as a four-fold, a 5 bet accumulator is a five-fold and so on. The number of selections in an accumulator bet. Punters can bet using a fold size lower than their number of selections, for example, 6 selections could be used as the basis for 6 5-fold accumulators. A bet that covers all doubles, trebles and accumulators for the selections. If two selections win you are guaranteed a return. Same as a full cover bet but with singles added for each selection. If one selection wins you are guaranteed a return. A sequence of bets to be completed if there is enough cash from the previous step in the sequence to continue. Part 1: Bet on selection 1. Part 2: Bet on selection 2 if sufficient cash left from part 1. Part 1: Bet on selection 2. Part 2: Bet on selection 1 if sufficient cash left from part 1. The SSA bet has a limit carry over of 1x the original stake into stage. Same as SSA but double the stake is used at each stage where sufficient cash is available. A 9 selection bet, laid out in a 3 by 3 grid. The grid is used to identify 8 groups of 3 by drawing lines horizontally (ABC, DEF, GHI), vertically (ADG, BEH, CFI) and diagonally (AEI, CEG) through the grid. These groups of 3 are used in the Union Jack bets outlined below.